Samuel Benjamin was born on 3 February 1757.1 He married Rachel Holcombe, daughter of Ozias Holcombe and Rachel Cornish. 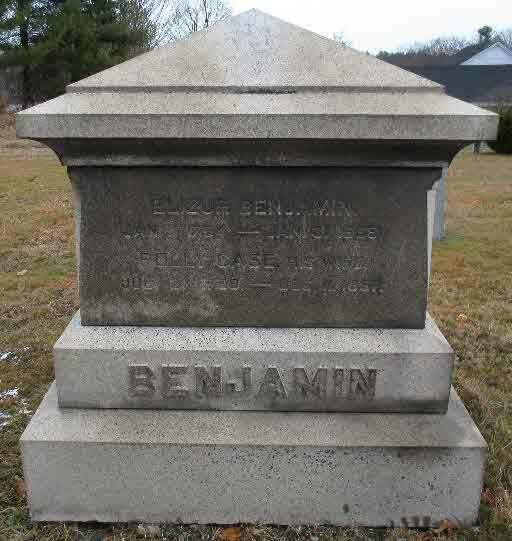 Samuel Benjamin married Diodama Sawyer on 27 November 1809 at Granville, Hampden Co., MA.2 Samuel Benjamin died on 7 October 1843 at age 86.1 He was buried at Granby Center Cemetery, Granby, Hartford Co., CT.
[S807] Find A Grave, online http://www.findagrave.com, Find A Grave, database and images (https://www.findagrave.com : accessed 26 February 2019), memorial page for Elizur Benjamin (11 Jan 1784–31 Jan 1868), Find A Grave Memorial no. 64167785, citing Granby Cemetery, Granby, Hartford County, Connecticut, USA ; Maintained by M Cooley (contributor 47154454) . Samuel and Asenath were enumerated in the 1850 Granby, Hartford Co., CT, federal census. He was a farmer, age 52, she was 42. The only child in the household was Samuel Jr. 8. Roxy Benjamin was born at Granby, Hartford Co., CT.1 She was the daughter of Samuel Benjamin and Rachel Holcombe. Benjamin Giddings was born in 1756 at Lyme, New London Co., CT. He married Affiah Holcombe, daughter of Ozias Holcombe and Rachel Cornish, in October 1781 at Granby, Hartford Co., CT. Benjamin Giddings died on 23 February 1830 at Hartland, Hartford Co., CT. He was buried at Hartland Hollow Cemetery (cemetery moved), Hartland, Hartford Co., CT.
Julia Hayes was born on 15 December 1795 at Granby, Hartford Co., CT. She was the daughter of Phinehas Hayes and Electa Stebbins. Miranda Hayes was born on 23 December 1797 at Granby, Hartford Co., CT. She was the daughter of Phinehas Hayes and Electa Stebbins. Miranda Hayes died on 18 May 1874 at age 76. Electa Hayes was born on 16 June 1800 at Granby, Hartford Co., CT.1 She was the daughter of Phinehas Hayes and Electa Stebbins. Electa Hayes married Truman Allen, son of Justus Allen and Mabel Ives. Electa Hayes died on 26 November 1889 at age 89. Maria Hayes was born on 11 May 1802 at Granby, Hartford Co., CT. She was the daughter of Phinehas Hayes and Electa Stebbins. Harriet Hayes was born on 10 December 1806 at Granby, Hartford Co., CT. She was the daughter of Phinehas Hayes and Electa Stebbins. Emily Hayes was born on 4 February 1808 at Granby, Hartford Co., CT. She was the daughter of Phinehas Hayes and Electa Stebbins. Fanny Hayes was born on 28 March 1811 at Granby, Hartford Co., CT. She was the daughter of Phinehas Hayes and Electa Stebbins. Fanny Hayes died on 11 January 1870 at age 58. Elmina Hayes was born on 6 April 1817 at Granby, Hartford Co., CT. She was the daughter of Phinehas Hayes and Electa Stebbins. Elvira Hayes was born on 6 April 1817 at Granby, Hartford Co., CT. She was the daughter of Phinehas Hayes and Electa Stebbins. Keturah Skinner was born on 7 July 1799 at Orange Co., NY. She was the daughter of Daniel Skinner and Mary (?) Keturah Skinner married Drayton Holcombe, son of Grove Catlin Holcombe and Aurelia Holcombe, on 17 March 1818. Keturah Skinner died on 24 August 1846 at age 47. Julia Ann Beam was born in 1820. She married Drayton Holcombe, son of Grove Catlin Holcombe and Aurelia Holcombe. Julia Ann Beam died in 1863. Mary Aurelia Holcombe was born on 31 December 1819 at Orange Co., NY. She was the daughter of Drayton Holcombe and Keturah Skinner. Mary Aurelia Holcombe married Francis Gore Summers on 22 September 1835. Mary Aurelia Holcombe died on 23 October 1881 at age 61. [S25] Hannah McPherson, Holcombe Genealogy, Page 165.1/Item A-8-1-6-5-1-1-1. Marjorie Holcombe was the daughter of Drayton Holcombe and Keturah Skinner. Jeptha was buried with wife in Doan's Ridge Cemetery, Welland Co., Ontario, canada, where both have inscribed grave stones, showing birth and death dates, his age being 40, hers, 55 years. Jeptha Holcombe was born on 25 April 1825. He was the son of Drayton Holcombe and Keturah Skinner. Jeptha Holcombe married Ellen Richardson. Jeptha Holcombe died on 26 June 1865 at age 40. [S25] Hannah McPherson, Holcombe Genealogy, Page 167.1/Item A-8-1-6-5-1-1-3. Norman was a messenger from the family home at Crowland Twp., farm Welland Co., Ontario, to his father, Drayton Holcombe, when a refugee in Buffalo, NY when a lad hardly in his teens. Sarah Horton's father, Zaphaniah, was a New England Loyalist who settled in Pelham Twp., Welland Co., Ontario in 1812. The farm he established there continued in possession of his descendants to the 5th generation. One other of his daughters and two of his sons married Holcombe brother and sisters of Norman Chandler. Norman Chandler Holcombe was born on 1 July 1827. He was the son of Drayton Holcombe and Keturah Skinner. Norman Chandler Holcombe married Sarah Horton, daughter of Zaphaniah Horton and Abigail Thomas. [S25] Hannah McPherson, Holcombe Genealogy, Page 168.1/Item A-8-1-6-5-1-1-4. Susan Keturah Holcombe was born on 19 February 1832. She was the daughter of Drayton Holcombe and Keturah Skinner. Susan Keturah Holcombe married David W. Horton, son of Zaphaniah Horton and Abigail Thomas. [S25] Hannah McPherson, Holcombe Genealogy, Page 169.1/Item A-8-1-6-5-1-1-6. Dorothy E. Holcombe was born on 27 August 1834. She was the daughter of Drayton Holcombe and Keturah Skinner. Dorothy E. Holcombe married Paul P. Horton, son of Zaphaniah Horton and Abigail Thomas. [S25] Hannah McPherson, Holcombe Genealogy, Page 169.1/Item A-8-1-6-5-1-1-7. McPherson notes no children by either marriage. William W. Holcombe was born on 20 September 1838. He was the son of Drayton Holcombe and Keturah Skinner. [S25] Hannah McPherson, Holcombe Genealogy, Page 169.2/Item A-8-1-6-5-1-1-8. James C. Holcombe was born on 31 May 1842. He was the son of Drayton Holcombe and Keturah Skinner. James C. Holcombe married Ruth Horton, daughter of Zaphaniah Horton and Abigail Thomas. James and Ruth were enumerated in the 1881 Pelham, Monck, Ontario, Canadan Census. He was a farmer, age 38, she was 37. Children in the household were William T. 12, Norman C. 8, and David W. 5. [S25] Hannah McPherson, Holcombe Genealogy, Page 169.2/Item A-8-1-6-5-1-1-9. Chapin Van Rensselaer Holcombe was born on 5 April 1848. He was the son of Drayton Holcombe and Julia Ann Beam. Chapin Van Rensselaer Holcombe married Alice Clark, daughter of Ralsamon Aaron Clark and Ellen Holcombe, in June 1872 at Greenville, Mercer Co., PA.
[S25] Hannah McPherson, Holcombe Genealogy, Page 170.1/Item A-8-1-6-5-1-1-10. Francis Gore Summers was born on 18 August 1816. He married Mary Aurelia Holcombe, daughter of Drayton Holcombe and Keturah Skinner, on 22 September 1835. Francis Gore Summers died on 4 June 1881 at age 64. Daniel Grove Holcombe was born on 31 May 1821. He was the son of Drayton Holcombe and Keturah Skinner. Daniel Grove Holcombe married Margaret Buck on 6 May 1845. Daniel Grove Holcombe married Mary Muffett in 1892. Daniel Grove Holcombe died on 19 December 1924 at Louth, Ontario, Canada, at age 103. McPherson notes that Daniel has been erroneously called "Drayton G." Holcomb in his published obituary. Other records and publications definitely identify him as "Grove" and "Daniel Brove". He was a farmer and saw mill operator. He moved to Cook's mill, Welland Co., Ontario, as a young man and in about 1886 moved to saw mill operations in Minn. for 8 years, when he returned to Louth, Ontario, Canada. He was a member of Rockway Presbyterian Church and of Mountain Lodge of Masons, being the oldest Mason in Canada, having joined 82 years previously. As a boy he had driven teams on tow path of the first Welland Canal; had lived under 4 soverigns of Great Britain; fought in the Fenian raid. [S25] Hannah McPherson, Holcombe Genealogy, Page 166.1/Item A-8-1-6-5-1-1-2. Sarah Holcombe was born at Pelham Twp., Welland Co., Ontario, Canada. She was the daughter of Daniel Grove Holcombe and Margaret Buck. Sarah Holcombe lived in 1924 at St. Cloud, FL. [S25] Hannah McPherson, Holcombe Genealogy, Page 166.1/Item A-8-1-6-5-1-1-2-1. Norman Wilson Holcombe was born on 13 October 1849 at Pelham Twp., Welland Co., Ontario, Canada. He was the son of Daniel Grove Holcombe and Margaret Buck. Norman Wilson Holcombe married Martha Elizabeth Smith on 4 September 1877. Norman Wilson Holcombe died on 1 March 1924 at age 74. [S25] Hannah McPherson, Holcombe Genealogy, Page 166.1/Item A-8-1-6-5-1-1-2-2. Francis Morris Holcombe was born on 11 March 1852 at Pelham Twp., Welland Co., Ontario, Canada. He was the son of Daniel Grove Holcombe and Margaret Buck. Francis Morris Holcombe married Alice Melissa Wright. Francis Morris Holcombe died in 1930. Francis was a farmer in Power Glen, a hamlet at the DeCaw Falls power house of the old Cataract Power Co., Welland Co., Ontario. He fought in the Reil Rebellion and had in his home there in 1923 his father, Daniel Grove Holcombe, 103 years old. [S25] Hannah McPherson, Holcombe Genealogy, Page 166.2/Item A-8-1-6-5-1-1-2-3. Headley married but had no children. Headley Holcombe was the son of Daniel Grove Holcombe and Margaret Buck. Mary Muffett married Daniel Grove Holcombe, son of Drayton Holcombe and Keturah Skinner, in 1892. Mary Muffett died in 1918. Martha Elizabeth Smith was born on 6 January 1856 at Louth, Ontario, Canada. She married Norman Wilson Holcombe, son of Daniel Grove Holcombe and Margaret Buck, on 4 September 1877. Martha Elizabeth Smith died on 4 August 1916 at age 60. Maud Evelyn Holcombe was born on 2 September 1878 at Thorold Twp, Welland Co., Ontario, Canada. She was the daughter of Norman Wilson Holcombe and Martha Elizabeth Smith. Maud Evelyn Holcombe married John Baxter on 22 May 1915. [S25] Hannah McPherson, Holcombe Genealogy, Page 166.1/Item A-8-1-6-5-1-1-2-2-1. James Wilson Holcombe was born on 31 August 1880 at Thorold Twp, Welland Co., Ontario, Canada. He was the son of Norman Wilson Holcombe and Martha Elizabeth Smith. James Wilson Holcombe married Jeletta Pound on 1 September 1908. James Wilson Holcombe died on 30 January 1920 at age 39. [S25] Hannah McPherson, Holcombe Genealogy, Page 116/Item A-8-1-6-5-1-1-2-2-2. Everand Ross Holcombe was born on 5 June 1886 at Humberstone Twp., Welland Co., Ontario, Canada. He was the son of Norman Wilson Holcombe and Martha Elizabeth Smith. Everand Ross Holcombe married Alice May Walters on 12 April 1917. Everand Ross Holcombe died on 26 June 1977 at age 91. [S25] Hannah McPherson, Holcombe Genealogy, Page 166.2/Item A-8-1-6-5-1-1-2-2-3. Martha Edna Belle Holcombe was born on 27 August 1889 at Humberstone Twp., Welland Co., Ontario, Canada. She was the daughter of Norman Wilson Holcombe and Martha Elizabeth Smith. Martha Edna Belle Holcombe married Harvey Milton Dennis on 15 March 1921. [S25] Hannah McPherson, Holcombe Genealogy, Page 166.2/Item A-8-1-6-5-1-1-2-2-4. Alberta Sarah Almeda Holcombe was born on 12 July 1891 at Humberstone Twp., Welland Co., Ontario, Canada. She was the daughter of Norman Wilson Holcombe and Martha Elizabeth Smith.